Book your next private flight to the southeast with Georgia Jet Charter. Whether you’re hiring a private jet to Atlanta for business based in or around Fulton County, or for a leisurely stay at one of Georgia’s beautiful luxury resorts, we can help arrange the right aircraft and flight itinerary that best suit your needs. Georgia Jet Charter believes in providing private flyers with a one-on-one consultative service experience that exceeds every expectation. We understand that your time, privacy, flight preferences and most of all, safety, are all extremely important. Our private jet charter agents are available for you by phone and email 24 hours a day, 7 days a week. When using our private aviation service for your trip to Georgia, you can expect quick response times and an easy, hassle-free booking process. Request a quote or call us to arrange your private flight to Georgia. 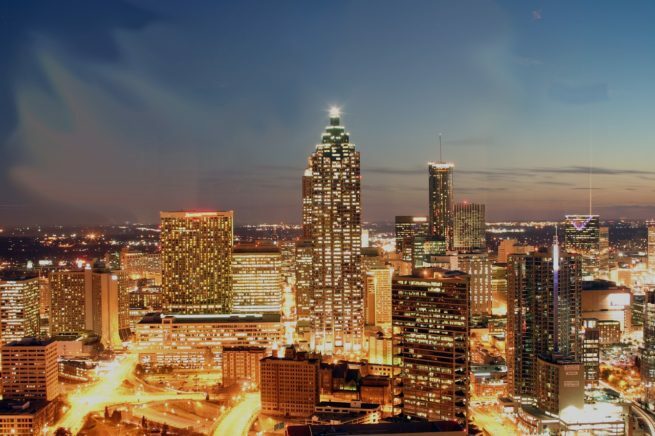 Atlanta is the business hub of the south, and in its metropolitan area there are more lodging, eating, and nightlife options than any other city in the South. Private jet travelers will find that Atlanta leaves no stone un-turned when it comes to private amenities and overall client comfort and satisfaction. As for the best time to visit Atlanta, many prefer fall as it’s not extremely cold and the tree leaves are all changing colors in preparation for winter. Learn how we can arrange your private charter flight to arrive at (PDK) Dekalb-Peachtree Airport, or the Atlanta airport of your choice. Augusta is a flagship among the Georgian city fleet. Nestled right up next to the Savannah River, this bustling residential town has plenty to offer to private jet travelers. Take an evening and hit the town after a day exploring the local nature preserves; Augustus’ downtown area will not disappoint. If you’re interested in attending the Masters Golf Tournament in May, or you’re a member at Augusta National Golf Club, we can arrange your private flight to arrive at (AGS) Augusta Regional Airport at Bush Field, with transportation to take you to the hotel of your choice. The veritable golf capital of the South, Hilton Head Island is a place that caters to travelers who want to spend a week or two out on the green. Practice your putting game while having a few cocktails, and then soak your tired feet in the hot tub at one of the several ritzy resorts on the island. If you aren’t much of a golfer, then there are several bike trails, nature parks, and beautiful beaches to keep you occupied. Fly private into (HHH) Hilton Head Airport on a luxury private jet. Private Jet Charter Hilton Head. Savannah residents often joke that in Atlanta the locals ask you your business; in Charleston they ask your mother’s maiden name; and in Savannah they ask what you want to drink. Such a joke really exemplifies the Savannah mentality; it’s the most interesting city in Georgia for good reason. Head over to Forsyth Park to reassert your relationship with nature, or to the Savannah Historic District to enjoy some world-class southern cooking. Learn how you can arrange a private flight to (SAV) Savannah/Hilton Head International Airport. Located off the coast of Georgia in the Atlantic Ocean, Sea Island groups together with St. Simmons Island to form a luxurious and quaint getaway for upper-middle class families and affluent travelers and hunters. After arranging your private flight to either (SSI) McKinnon St. Simons Island Airport or (BQK) Brunswick Golden Isles Airport, make sure you book your resort nights early because vacancies fill up quickly. You need not worry about food, as the resorts often have all-inclusive packages and there are also several 5-star restaurants in the area. Learn more about arranging flights to Sea Island and the Golden Isles of Georgia. Charter a private flight to (TVI) Thomasville Regional Airport with Georgia Jet Charter. Nearly the largest city in Southwest Georgia, Thomasville is a charming and old-fashioned southern town. Thomasville is full of colonial architecture and various buildings of American antiquity, and the various plantations throughout the city are definitely worth checking out. Head to Thomasville to experience authentic Southern culture. Valdosta has a residential population of about 55,000 and has been under major development for the past decade or so. The region is serviced by (VLD) Valdosta Regional Airport, and we can arrange your private aircraft to land at a private terminal with ground transportation waiting. It’s now one of the fastest growing cities in the United States and new businesses are popping up everyday all over the city. As Valdosta frequently reaches temperatures of over 105 degrees Fahrenheit, it’s best to visit in between September and May. Georgia Jet Charter uses the following airports to arrange flights to/from Atlanta, Savannah and surrounding areas of Georgia. Request a Quote or give us a call at 1-888-987-5387 to speak with our Georgia Private Jet Charter team and arrange a private flight for your next luxury vacation, business trip or special event.